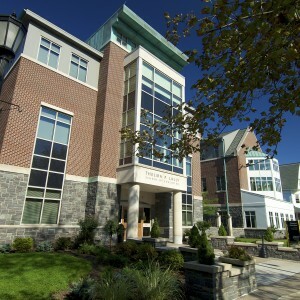 The College of Saint Rose Academic Facilities. LIMITED SPACE AVAILABLE IN OUR MORNING AND AFTERNOON PROGRAMS FOR THE 2018-2019 SCHOOL YEAR! Thank you for considering the Nursery School at the College of Saint Rose as your child’s first classroom. Our program offers children an inviting, safe place to explore, discover, learn, and grow. The high-quality, developmentally appropriate program we provide gives children and their families an exciting first school experience! The Emery Educational and Clinical Services Center at the Thelma P. Lally School of Education announced the opening of The Nursery School at The College of Saint Rose beginning in the fall of 2003. When implemented, the Nursery School included a half day morning program serving a maximum of 12 three-and four-year-old children. The Nursery School currently offers a morning three-year-old program and an afternoon four-and five-year-old program including Universal Pre-Kindergarten. The Nursery School now serves between 20 and 30 families. The cornerstone of successful early childhood education is a strong partnership between the school and family. We strive to create a positive, respectful relationship with each family served. Parents are welcome and necessary players in their child’s nursery school experience. Together, we can help your child develop and succeed. At the Nursery School we understand that children are primarily active learners with a variety of interests and motivators. Because preschoolers learn best through active engagement with their world, the nursery school program provides opportunities to explore and manipulate materials in a variety of interest areas. Children are encouraged to investigate, ask questions, draw conclusions and make discoveries in centers which offer diverse options for learning. Centers with a focus on Dramatic Play, Block Play, Art, Science, Social Studies, Math and Language Arts promote the development of initiative and independence and present children with an array of appealing choices for exploration. Opportunities for outdoor investigation as well as music and movement further support children’s varying interests and abilities. Interactions with peers and adults assist children in developing the ability to think critically, work cooperatively and problem-solve about relevant, meaningful content. The nursery school program provides a child-centered, developmentally-appropriate early childhood environment that supports children’s emerging language, literacy, cognitive, physical and social skills. The teaching staff engages in weekly planning sessions to construct a creative and stimulating curriculum based upon the individual needs and interests of the children. The school day provides a balance of quiet and active play, both indoors and out, through a blend of individual, whole group and small group activities. A mix of teacher-led and child-directed activities support the intellectual and emotional development of young children. The daily schedule also offers opportunities for creative expression in literacy, drama, the visual arts, music and movement. Our enriched classroom environment builds upon children’s knowledge and experiences, with an appreciation for the uniqueness of each learner. Adults provide a nurturing, emotionally safe and responsive environment. Teachers demonstrate a strong understanding of current child development theory as they design and implement teaching strategies which accommodate a range of learning styles and needs. The nursery school adheres to the principles set forth in the NAEYC (National Association for the Education of Young Children) Code of Ethics, and all adults model respect for the diversity of each child and recognize the importance of each child’s family and home culture. To read what current nursery school families are saying about our program click here! The three-year-old program runs from 8:30 – 11:00 a.m. on Monday, Tuesday, Thursday, and Friday mornings. Families may choose to send their child 3 or 4 mornings per week. Families are given choice when selecting which days their child will attend school when possible . The afternoon program runs from 12:00 – 3:00 p.m. Monday through Friday. At this time families may choose to send their child 3, 4, or 5 afternoons per week. Choice in which days your child attends school is given when possible based on enrollment. In 2008 the Nursery School @ The College of Saint Rose became an agency partner with the City School District of Albany’s Universal Pre-Kindergarten (UPK) program. In order to be eligible for this tuition free program the following criteria must be met: * You must live in the Albany City School District * Your child must turn 4 by December 1st of the current year * Your child must attend school 5 days per week To learn more about the UPK program and your family’s eligibility please contact the director. Laura Sorrentino, Director/Head Teacher of The Nursery School at The College of Saint Rose is a master level teacher. She earned her master’s degree in Early Childhood Education from The College of Saint Rose after completing her undergraduate studies in early childhood development and practice at Cornell University (Ithaca, NY). Laura holds a teaching certificate in Early Childhood Education, Birth – Grade Two. Before coming to The Nursery School in January 2007, Laura worked with at risk families and students in three and four-year-old Head Start classrooms. She also taught pre-kindergarten and an integrated special education pre-school class both in the Capital Region. While at Cornell, Laura had the wonderful opportunity to spend a semester in Sweden working with three to five-year-olds in a Swedish pre-school. Since becoming the Director of the Nursery School, Laura has seen the program experience many changes. Families living in the Albany City School District are now able to take advantage of the benefits offered by the implementation of Universal Pre-Kindergarten. Laura has implemented programs such as the St. Jude’s Trike-A-Thon which provides children with an opportunity to experience helping others less fortunate than themselves. Children in both the morning and afternoon programs now have the opportunity to learn Spanish in our Curriculum Library at the college. Laura is also working to begin a parent education and information program during the next school year. All families interested in our program should contact the Director to schedule a visit with your child. Upon visiting, you will receive an application form. Should you choose our program for your family, the application must be submitted with a $100.00 non-refundable registration fee. The first month’s tuition is due July 1st prior to the start of the school year. This payment is non-refundable. Full time enrollment is identified as 4 days per week in the morning program and 5 days per week in the afternoon program. The nursery school requires a $100 registration fee when registering for our program. This fee is non-refundable. The first month’s tuition is due by July 1 prior to the start of the upcoming school year. This payment is non-refundable. Members of the Saint Rose community including faculty, students, and alumni are given a 10% tuition discount. Families with more than one child enrolled in the program concurrently will also receive a 10% discount. Only one discount is given per eligible family. Should we receive more applications than space can allow, we will begin a waiting list. Families on the waiting list must go through the normal application process and submit the registration fee. If you do not get accepted, your registration fee will be returned. If you get accepted and decline the spot, the fee will not be returned. Interested families should contact the Director one year prior to your child’s school start date to begin the application process. The Nursery School at The College of Saint Rose is actively working toward accreditation by the National Association for the Education of Young Children (NAEYC). NAEYC administers the largest and most widely recognized national voluntary professionally sponsored accreditation system for all types of early childhood schools and child care centers and is the nation’s largest organization of early childhood educators. Early childhood programs accredited by the National Academy of Early Childhood Programs – NAEYC’s accreditation department – have voluntarily undergone a comprehensive process of internal self-study, invited external professional review to verify compliance with the Criteria for High-Quality Early Childhood Programs, and been found to be in substantial compliance with the Criteria. A copy of the Criteria can be obtained from NAEYC’s Academy. 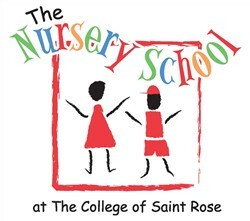 In addition to seeking NAEYC accreditation the Nursery School @ The College of Saint Rose is in the process of registering with New York State as a Nonpublic Nursery School and Kindergarten. For more information on this process please visit Voluntary Registration of Nonpublic Nursery Schools and Kindergartens General FAQs. Visit this site to learn more about what our partnership with the Albany City School District's Universal Pre-K program has to offer!